The Tories have had enough of being ‘liberal’. Cameron thought that supporting gay marriage was pretty much a cost free way of showing off his party in a modern and socially progressive light, unlike the “swivel eyed loons” of UKIP who are advancing on the Tories from the right. However Cameron got badly burnt by a revolt of his back-benchers showing that the swivel eyed loons are still at the heart of the Tory party. So how to appease the right, stem the defections to UKIP and demonstrate to the electorate that the Tories have not begun an irredeemable descent into the abyss of political correctness? The answer had to be a bit of good old fashioned British xenophobia. After all Johnny Foreigner was pushing his luck, sleeping in our garden sheds, working for less than the minimum wage, going to the doctor and even studying at our universities. Something had to be seen to be done. 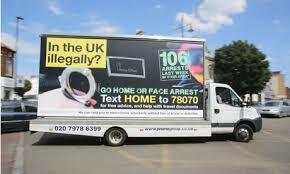 So the Home Office commissioned some vans with huge billboards and drove them around several London boroughs with high immigrant populations. The billboard message advised illegal migrants to go home, to call the telephone number shown and hand themselves in, otherwise they would be arrested and deported. And to reinforce the message the billboard displayed (totally inaccurate) figures for how many had been recently arrested in the local area. The real purpose of the vans was not to get illegal immigrants to hand themselves in – it is very unlikely that those without immigration status will have forgotten that they do not have permission to be in the country, and when they see the vans will remember that they shouldn’t really be here and go and give themselves up to the authorities – but to foster a climate of fear amongst legal and illegal immigrants whilst appealing to xenophobic and racist sentiments in the broader population. The Home Office telephone numbers on the vans were, in the manner of totalitarian regimes, more about encouraging others to report those without visas rather than getting people to turn themselves in. The aim was to drive a wedge between illegal and legal migrants and between the migrant and non migrant population. Predictably the vans provoked outrage among local community groups, NGOs and political parties. Even Britain’s most famous xenophobic pub bore, Nigel Farage of UKIP, described the billboard campaign as ‘nasty’ much to the chagrin of the Government who created the campaign to appeal to voters who might be attracted to UKIP. After several weeks the Home Office agreed to withdraw the vans, at least temporarily. Now it wasn’t the case that the Home Office suddenly had a change of heart, but that they had been threatened with legal action and the billboard campaign was very likely to be judged illegal if the case went to court. Under section 149 of the Equalities Act 2010, public bodies are subject to a ‘public sector equalities duty’ which means that policies must have ‘due regard’ to elimination of discrimination, harassment and victimisation and to the advancement of equality of opportunity and fostering good community relations. Having ‘due regard’ means that policies do not have to conform to all the section 149 requirements but the Home Office should at least have consulted on the potential impact of the policy on lawful migrants and immigrants. This means that once ‘consultation’ has taken place the Home Office could re-start the billboard campaign if it can justify this as proportionate and reasonable in the circumstances. Along with the billboard campaign the issue of immigration ‘spot checks’ has also made headline news recently. This is nothing new as spot checks have been carried out by Immigration Officers, often working with the police over many years. Typically the checks are carried out in places where those without immigration status are believed to congregate such as tube stations and workplaces. Immigration Officers can only lawfully question and arrest someone if they have reasonable suspicion that a person has committed an immigration offence. The concern is that spot checks are often based on racial profiling, i.e. stopping someone merely on the basis of their appearance or accent rather than the basis of intelligence that the person is an immigration offender. The result is that many of those stopped and questioned are UK nationals or otherwise lawfully resident. For this reason the spot checks are often recognised as a form of racial harassment which create fear and resentment in immigrant communities. Immigration policy, not just in Britain but in pretty much every country throughout the world is characterised by the blatant hypocrisy of the ruling class. Free movement of capital across the globe is regarded as a fundamental right, yet international free movement of labour (with certain exceptions such as the EU) is not. On the one hand migrant labour, whether illegal or legal, is encouraged or at least tolerated by the state since migrant workers are the most vulnerable to be subjected to low pay below any minimum wage and the most appalling conditions. There are 7.3 million foreign born people in the UK, over 2 million of whom are in London. These are those legally in the UK. In addition there are estimated to be 500,000 or so illegal immigrants. There is no way most of these people could be here if the ruling class did not want them here. Sections of the bourgeoisie, oppose a cap on immigration and others, such as the London Mayor Boris Johnson, suggesting an amnesty for illegal immigrants. The problem for the working class in the UK and globally is our low level of class confidence which allows such fears regarding immigration to get a hearing. For over thirty years we have been attacked economically as well as politically our wages have been severely cut while the services that many of us rely on has also been cut back to the bone. In conditions such as this the reformist organisations of the working class have proven time and time again to be not only of no use but have actually participated in the attacks for instance the last labour government bailed out the banks while slashed social spending in real terms. Unfortunately the bankruptcy of the reformist organisations has not led to a growth in Communist organisations or even a growth in a Communist consciousness amongst the working class. In fact I think that amognst all the passivity displayed by the working class in the current crisis there is a danger that soft forms of racism will grow and will weaken our ability to fight back as a class. PBD call for workers of the world to unite is a sound rallying cry but how this will come about given the low level of class combativity and a lack of a Communist perspective within the working class remains to be seen. Hi Dave. Surely it isn't that the "reformist organizations" as you call them are bankrupt, and therefore no longer any use to the working class, but that they are now part of the bourgeoisie. When did the Labour Party do anything for the working class except confuse it and control it for the rest of the bourgeoisie to which the Labour Party belongs. Ditto the Trade Unions. I agree with you that the outlook for class struggle and for the development of an international communist organization looks very bleak at the moment. Hi Charlie I agree that both the unions and in the Labour Party have never been vehicles for socialism and that there has always been a need to build a class consciouss political organisation that is an integral part of the working class. My point of the unions and Labour Party as being bankrupt reformist organisations is to recognise that these organisations were responses from workers to the effect of capitalist organisation and that they did play a part especially the unions in organising independently of the capitalists. In the early years of the unions they did organise for the right to vote, lower working hours, health and safety at work, reduction in hours and what came to be seen as the welfare state. So I would disagree that they never did anything positive. The problem is that both sets of organisations did never transcend the acceptance of the capitalist market. The situation now is different in the sense that even in the recent past there w\s some notion of socialism even if only as a form of state capitalism. Today any notion within the working class of organising society differently has been almost eradicated which means that reactionary notions regarding immigration does get a hearing within the working class. Does this mean that all we can do is fight for slight alleviations in the exploiation of the working class? I really don't know. all I do know is that we are living in bleak times.